It should come as no surprise that most University professors are liberal. What is surprising is the extent of the bias and how conservative students are intimidated to the point that they keep their political views “in the closet” for fear of retribution. An article in the January issue of Boston Magazine spoke about research conducted by Samuel Abrams, professor of politics at Sarah Lawrence College, in New York. 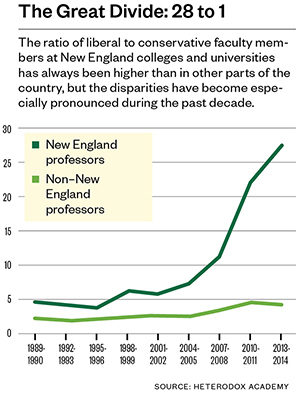 Abrams tabulated 25 years of worth of statistics from the Higher Education Research Institute and learned that in New England colleges, liberal faculty outnumber conservative faculty by a ratio of 28 to 1. The rest of the country has a ratio closer to 5 to 1 (83%), slightly better but still an indication that our kids of college are being brainwashed. The Liberal-Conservative ratio has gotten much wider in the past twenty-five years. Politics is something I don’t talk about with many people at all because of the ramifications,” says Mark Gimelstein, a senior at Brandeis and president of Brandeis Conservatives. A small campus group, it drew a handful of attendees to the weekly meetings I sat in on throughout October. None supported Trump; one student present was a liberal who kept showing up because he enjoyed the conversation; and several other members leaned more libertarian than conservative. “Another student, Michael Musto, a senior explained that when conservative icon Phyllis Schlafly died “one of his professors quipped, ‘There’s a special place in hell for people like her. '” But only a month later when liberal activist Tom Hayden passed away, that same professor gave Hayden glowing eulogy. If one can’t speak up and debate points at college, students will never learn to speak up, debate, and/or negotiate. In other words we are creating a generation of yes-people. It’s not just students and not just Brandies. The University of California system has become a hotbed of Antisemitism because professors and students do not like political views that are pro-Israel. Then there’s the case of James Miller economics professor at Smith College who made the mistake of writing an op-ed in National Review “in which he asserted that the dominance of liberals in academia skews scholarship to the point that aspiring professors are forced to pursue research pleasing to the liberal gatekeepers, who grant or deny tenure with the ruthlessness of Caesar at the Roman Forum. Eventually (thanks to an appearance on the O’Reilly Factor) Miller’s case became cause celebre, and the Smith College trustees stepped in and gave him tenure. Another example of the Brandies faculty’s quest for liberal political orthodoxy was in the news in 2014, when their professors demanded the school rescind their offer of an honorary degree to Ayaan Hirsi Ali. Ms. Hirsi Ali is a Somali-born American women’s rights activist, writer and politician who is known for her views critical of female genital mutilation and Islam (based on the fact that as a child she suffered mutilation). In 2005, she was named by Time magazine as one of the 100 most influential people in the world. She has also received several awards, including a free speech award from the Danish newspaper Jyllands-Posten, the Swedish Liberal Party’s Democracy Prize, and the Moral Courage Award for commitment to conflict resolution, ethics, and world citizenship. But the liberal faculty believed it was not appropriate to award this courageous woman an honorary degree and to address the graduating class. When selecting faculty, many universities try to create a diversity in race and religion, but it is long past time for the schools to try for diversity in thought. A politically diverse faculty will allow kids to learn to think and reason for themselves rather than being force-fed one point of view and taught to believe that liberalism is on the level of holy scripture. It’s a sad commentary on the future of America.